The most tragic loss of a church in recent years was that of St. Ann’s church of East 12th Street. 1) What had made this parish so special? The writer of the parish history identified this parish’s defining characteristic: St. Ann’s had always had a reach that extended beyond its parish boundaries. Under Fr. Thomas Preston, rector 1862-1891 (and Chancellor of the Archdiocese), this parish took a leading role in the city – and not just among Catholics. Fr. Preston’s preaching drew large crowds – supposedly including representatives of elegant society from all over the city. In architecture, Napoleon Lebrun (a parishioner) crafted one of his most perfect Gothic interiors. In music, this parish sponsored the first performance of Verdi’s Requiem in the United States in 1874. 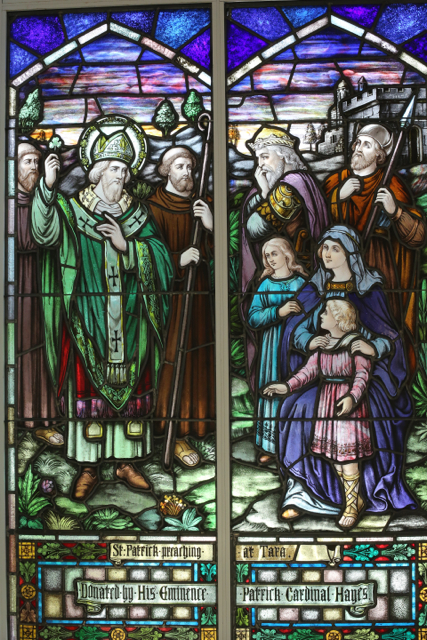 To care for the poor the parish, Fr. Preston helped to found in a new congregation: the Sisters of the Divine Compassion. That order later spread far from this parish. Indeed, Fr. 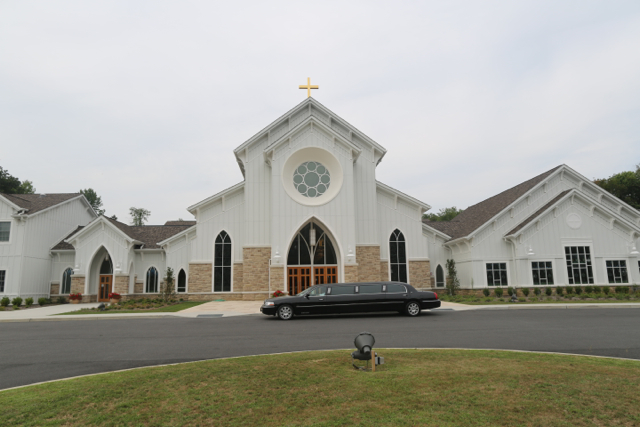 Preston’s body resides in a mausoleum at the chapel of the motherhouse in White Plains – which is currently up for sale…. By the 1950’s the parish was trying to reposition itself as a commuter church for the many shoppers frequenting what had become the bargain shopping area of the City. As time went on even these stores vanished. St. Ann’s had to reinvent itself once again – this time as a cathedral for the Armenian Catholics, as a national church for New York Ecuadorians and, after 2004, as one of the original two homes for the revived Traditional Latin Mass on the island of Manhattan. Once again St. Ann’s parish had reached out beyond the limitations of its neighborhood to find new congregations. It was an amazing place to experience the diversity (in a real sense) of the Catholic Church. 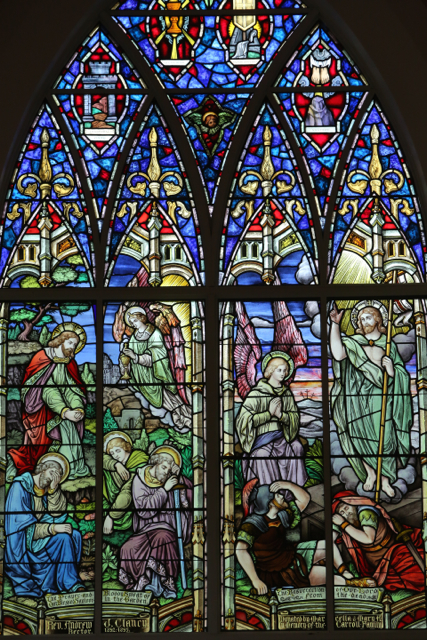 You can therefore imagine my interest when I heard that stained glass – and some other items – from St. Ann’s had been installed in a new church in Somers, in northernmost Westchester County. 3) The Archdiocese has claimed that it intends to save and recycle for ecclesiastical use all “artwork” from closed churches (as if architecture is not art). 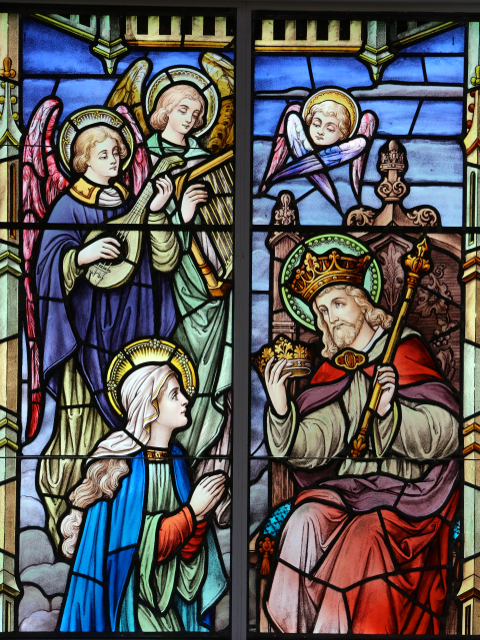 It had been reported, however, that stained glass from St. Ann’s was in the possession of private parties. 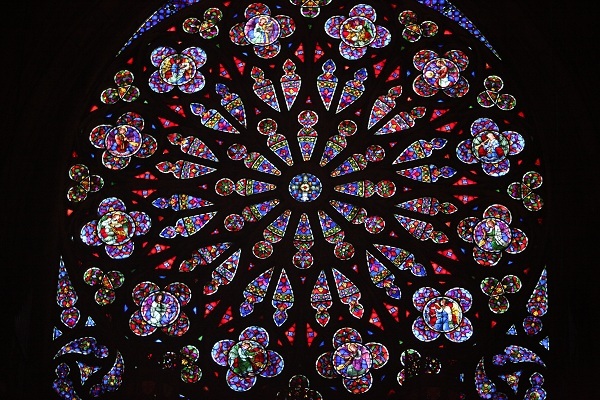 4) So I was curious to see how the recycling of art of St. Ann’s windows had worked out. St. Joseph’s and St. Ann’s form a contrasting pair. To compare them is perhaps invidious; the construction of a new church in upper Westchester county should have nothing to do with the demise ten years earlier of an ancient parish in the City. 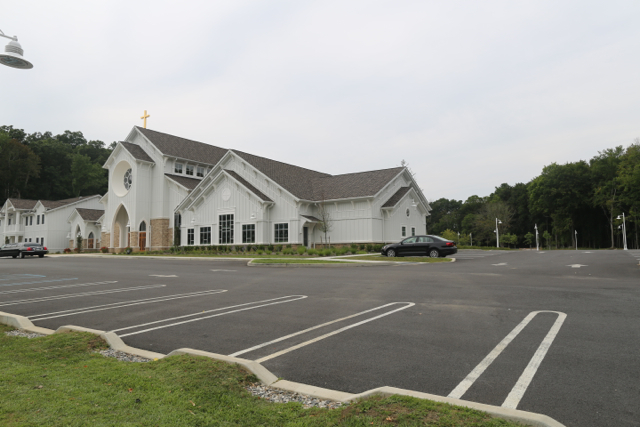 But the archdiocese itself forces the comparison upon us by holding forth St. Joseph’s as a success story of “reconfiguration.” The new church replaces three older churches and missions, which are being sold – the former parochial school of St. Josephs has also been closed (but is still in the parish’s hands). St. Ann’s was the creation of one of the leading architects of the day; St. Joseph’s is a pleasant structure in a highly stylized “Gothic” style. The layout is a cross between that of a traditional “basilica” and a centralized space so beloved by the liturgical renewal. The 1961 church of St. Theresa in Trumbull CT has vaguely similar ideas (especially in the interior) carried out much more impressively. 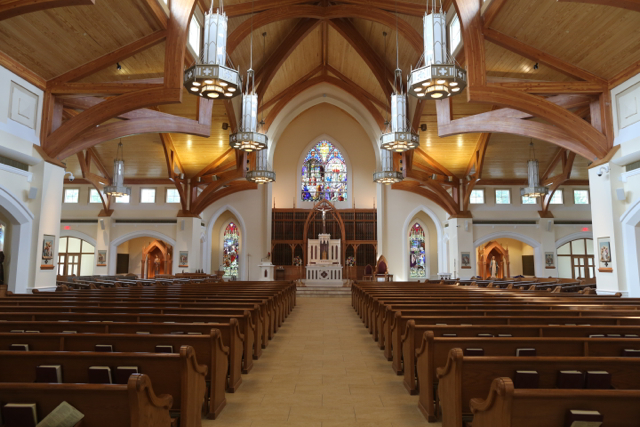 St. Joseph’s does represent a return to a ”modern” style that nevertheless retains the appearance of a church – unlike the lecture halls and hotel lobbies that have characterized the limited products of (Roman) Catholic Church architecture on the island of Manhattan in the last 45 years. We should be grateful for such favors! On a first visit St. Joseph’s is difficult to find; later one realizes that the road connections are very good. Indeed, facilitating car transport appears to be a major concern here; the church is separated from the surrounding nature by vast parking lots on every side. Another planning objective was to reduce the number of masses that had to offer on the weekend by uniting the congregations of several smaller churches in one large structure. 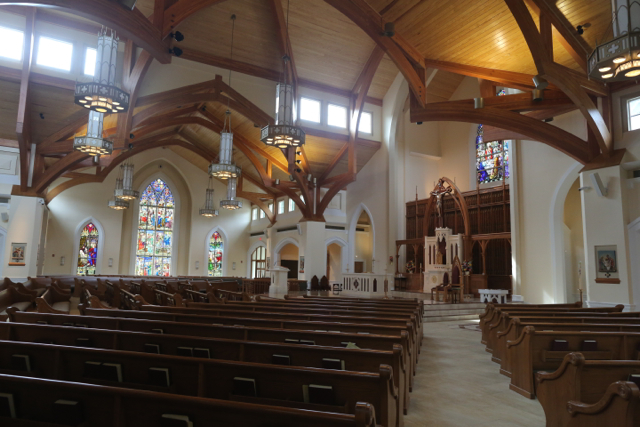 The complex of St. Joseph’s provides a number of different spaces for the use of the parish as well. (Above) The surrounding parking lots. 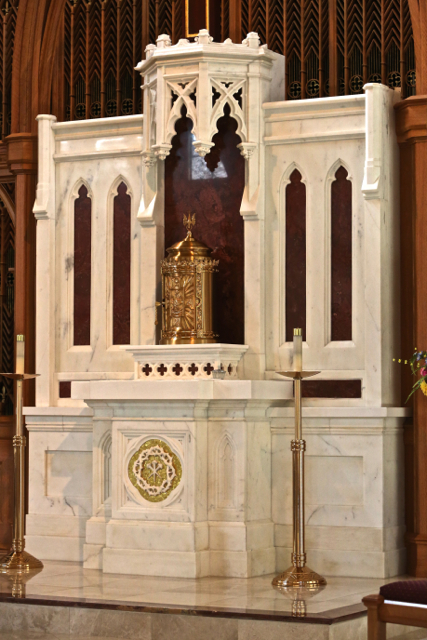 (Above) The altar and pulpit are also formed from marble taken from St. Ann’s. Inside, like most “conciliar” churches, all is brilliantly lit. There is, however, much natural wood and natural light. Architecturally there is a large separate chapel and what appears to be a world-class cry-room. Elements of Catholic devotion like statues are limited in number. Banks of unlit votive candles stand before them – perhaps it is a little early in the history of this new building for such devotion to take root. In summary, while old St. Ann’s was a highly visible building for a parish that exercised a citywide influence, St. Joseph’s is very much the secluded, private “chapel” of a religious minority, known only to initiates. It very faithfully illustrates the direction the Catholic Church – and the faithful of the Catholic church – have taken in this region over the last 50 years. Compare the style of the above window with the others. 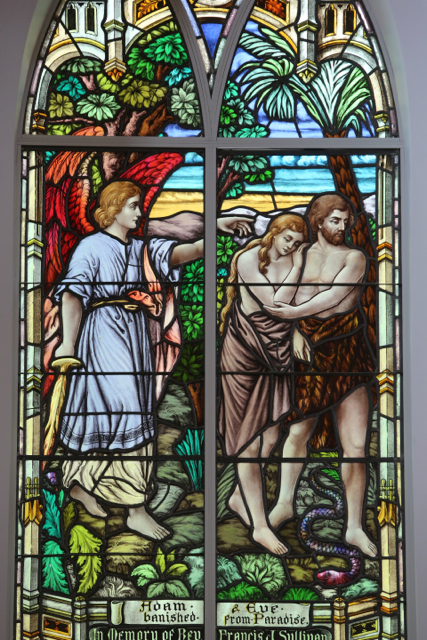 (Above) One of the windows with unusual Old Testament themes. 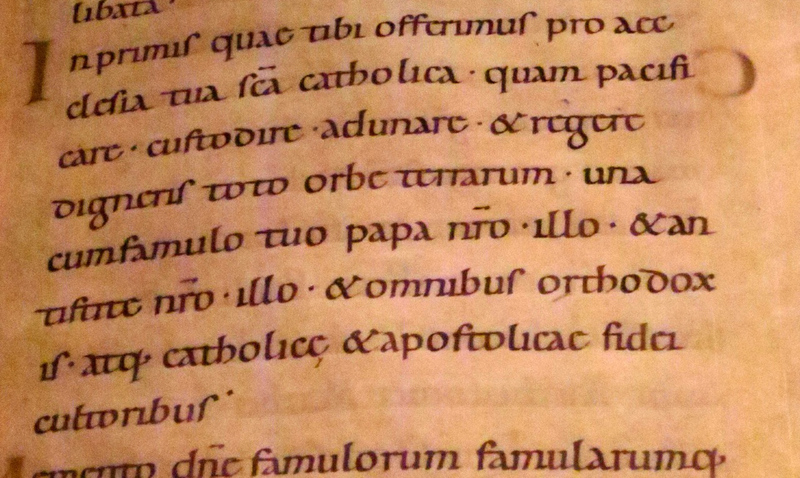 (above) Note the dedication from Cardinal Hayes. 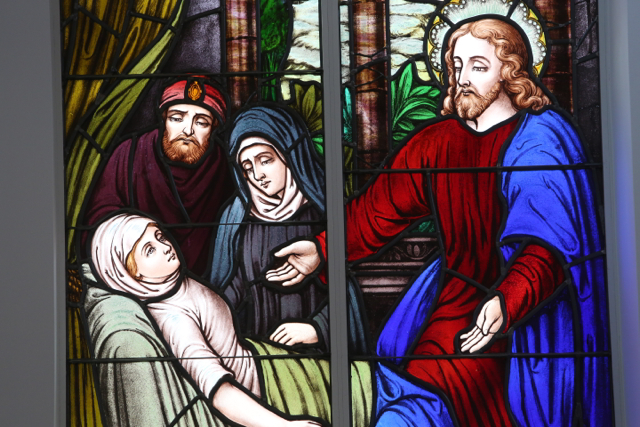 And what of the windows of St. Ann’s – the initial reason for our visit? To our disappointment we now realize that they date from the 1920’s and are not products of the absolutely best studios (one source says they are from France). 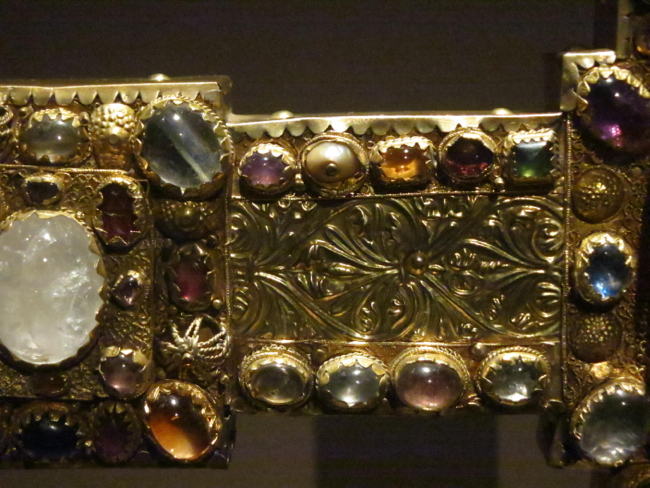 In addition, a number of much cruder windows are found – are they earlier, from another inferior workshop or did the come from the predecessor of the current church? 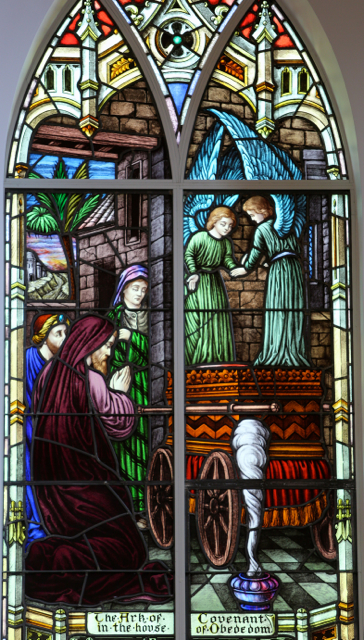 (The windows of the chapel came not from St. Ann’s but from the old St. Joseph’s church) Moreover, instead of the darkness of the interior of St. Ann’s, we have bright light everywhere, robbing the stained glass of much of its effectiveness. 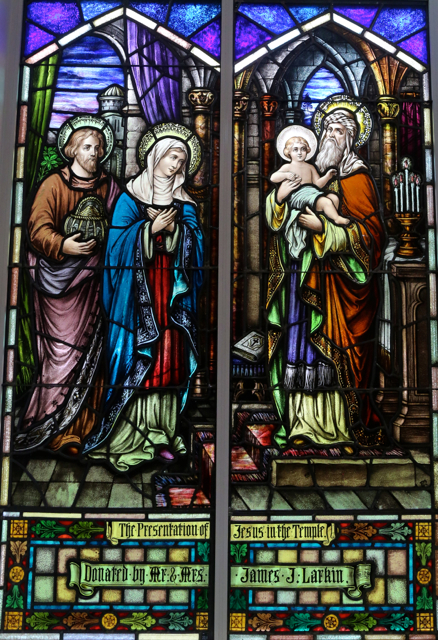 I believe not all the St. Ann’s windows could be accommodated at St. Joseph’s – I saw only three examples of the curious and unique Old Testament series. Thus, the sense of the complete program is lost. 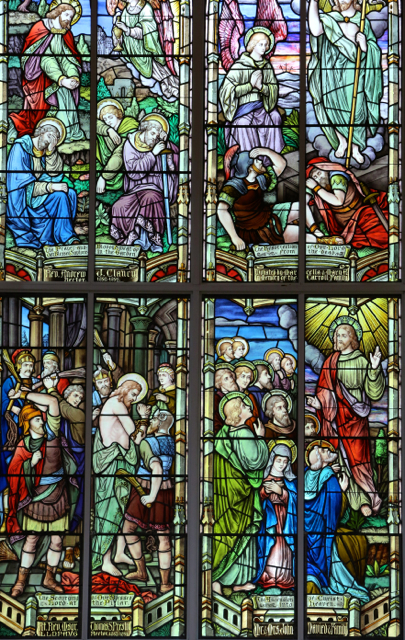 Nevertheless, the St. Ann’s windows are a colorful and comprehensive set of images, some highly unusual; I am glad that many of them have been saved here.